The previous story included September and October, the other numbers in the column labeled Cash Register Sales match the previous report. 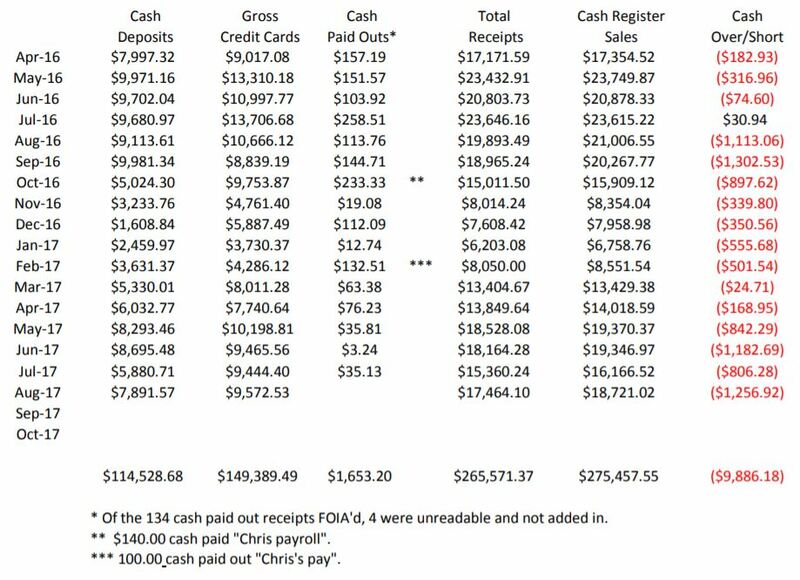 The total in that column should have equaled what was deposited in the bank – the Total Receipts column. Somebody needs to explain why the difference is almost $10,000! I know the person who compiled this report filed numerous FOIA requests looking for why the cash is off. The response received most often was “no records” match your request. This is more proof government isn’t capable of running a business. On January 24, 2018 the Edgar County Watchdogs will be Live Broadcasting the Hearing on the Atlanta Public Library appeal of the Illinois Secretary of State Library’s decision to require the repayment of the $25,000 “Live and Learn” grant it received several years ago. To see it live you have to be on Facebook. I’m sure they will post the video on their website later. Posted in BloNo, Local, Taxes.Tagged Atlanta Public Library, Bill Thomas, missing cash, Palms Grill. I think that fuzzy math is called new math in public school & the numbers don’t have to add up to be right! Do they have a time & place where the hearing will be held in Springfield? Glad to hear that people for those who can’t attend that there will be a live broadcast! Next Post Normal: questions, questions!